As we've seen with many individuals in the past, there are lots of ways to screw up on social media: horrible comments, inappropriate tweets, a timeline full of grammatically incorrect jargon...There's no end to them, but they're usually easy enough to fix or delete without it seeming like the end of the world. This all started because a disgruntled passenger named Kevin tweeted an image of a departures board showing cancelled trains, and wrote sarcastically: "Why, Ambassador @TLRailUK, with this fine service you are really spoiling us." ThamesLink replied: "Very sorry Kevin. Appreciate at the moment the service is less Ferrero Rocher and more Poundland cooking chocolate." Obviously, Poundland did not take this to kindly and absolutely bossed their response replying, "We think we have a pretty good idea of what great customer service is compared to most rail companies. But if we ever fall short, perhaps we'll describe ourselves as a bit ThamesLink." After Thameslink was publicly served all they could do is gracefully apologize whilst Poundland enjoyed some awesome free PR accumulating 7000 retweets and coverage from huge broadcasters such as Sky News, BBC, and the Guardian. Big businesses take note, this is a masterclass in how to professionally respond to an individual or business attacking you online while still maintaining your tone of voice and having fun - never hurts to gain a few followers and free publicity, too! 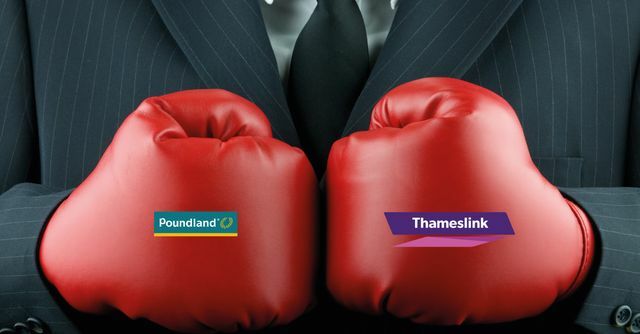 Poundland's retail director Austin Cooke issued a scathing response to Charles Horton, chief executive of Thameslink's parent company Govia Thameslink Railway (GTR), describing the train operator as "off the rails".